If critical color accuracy in your Adobe® Camera Raw (ACR) or Adobe® Photoshop Lightroom workflow is required, basICColor inputRAW will do the job. Analyzing the capture results of a camera target determines the reproduction characteristics of the camera. This helps to eliminate unnecessary color retouching. Professional results can be achieved with higher data quality as well as quicker turn-around times. basICColor inputRAW works with the basICColor dcam mini target and the basICColor Mini target, only. The basICColor dcam mini target is available separately or bundled with basICColor inputRAW – at a special price. The basICColor Mini target is included with Angelbird SD, CF and SSD drives. basICColor inputRAW makes DCPs (Digital Camera Profiles) with perfect definition especially in dark areas of the image. Handling is child´s play – just drag & drop your target shot onto the application window, everything else is fully automatic. Extra matte target for profiling digital cameras, even under difficult lighting conditions, 90x150mm. basICColor dcam mini target hard-backed with magnetic holder in tin box. basICColor Mini target included with selected Angelbird SD, CF and SSD drives. basICColor inputRAW detects (almost) every RAW format and creates DCPs, which can immediately be used in Adobe® Camera Raw or Adobe® Photoshop Lightroom. Check for promo code on selected Angelbird SD, CF and SSD drives packages. 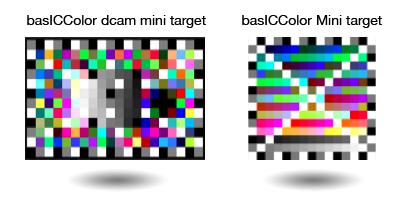 Bundle consisting of basICColor inputRAW and basICColor dcam mini target for an immediate start into Raw profiling. basICColor input 5, creates DCPs, ICC profiles and special Capture One ICC profiles from a huge variety of camera targets, e.g. the Digital ColorChecker SG and the additional Munsell Linear Grayscale for optimal gray balance. * basICColor Mini target is only available in combination with Angelbird hardware!